How to Keep Your Dishwasher Smelling Fresh? Use Affresh! A few years ago, I used the last of a small jar of minced garlic in a dish I was making for dinner. The tiny, 4-oz glass jar was so cute, I thought I would be able to repurpose it for something. Not thinking much of it, I rinsed it out and tossed it in the dishwasher. When the dishwasher ran that night, I noticed a strong smell of garlic still hanging in the air. Thinking it would dissipate as the cycle completed, I didn't give it another thought. The next day, I came home from work went to empty the dishwasher. Upon opening the door, I was overwhelmed with the odor of garlic that filled my kitchen. After inspecting several dishes, I realized that the garlic smell had permeated everything in the load. I took the clean garlic jar out, promptly recycled it, and set to work figuring out how to deodorize my dishwasher. After a few extra-hot loads with added lemon juice, the contents of the dishwasher were finally in a usable condition. My dishwasher, however, was in bad shape. I ran empty load after empty load with supposed odor-fighters like vinegar, baking soda and lemon juice. Each time, the smell was better, but it wasn't gone. Finally, after dumping an entire box of baking soda over the bottom of the washer and letting it sit overnight, I started the dishwasher with bleach in the detergent cup. That finally seemed to clear it up, but I cringe when I think about the water, power, and supplies I wasted just because I was dumb enough to wash a container filled with garlic! I definitely learned my lesson that time; I've never, ever put anything odorous in the dishwasher again! If I did, my first order of business would be to use Affresh Dishwasher and Disposal Cleaner to neutralize the smells. While my dishwasher has never smelled as bad as it did after the garlic incident, it occasionally takes on a stale odor, and there are mineral deposits that should be scrubbed every few months. Running an empty load with an Affresh tablet is all it takes to refresh the appliance and get it looking shiny bright on the inside. The instructions for Affresh Dishwasher and Disposal Cleaner actually state to use two tablets to clean the dishwasher, but it leaves behind a pretty strong citrus smell (which is FAR better than the previous smells! ), so I prefer to just use one. If I ever run into a garlic incident again, I'd definitely throw two in there to try to solve the problem as quickly as possible! Since I've been using Affresh for several weeks, I've noticed that I don't need to worry about mineral deposits. 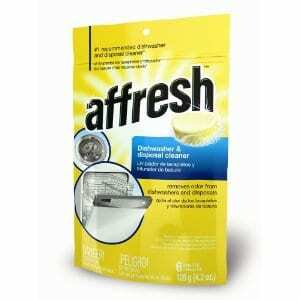 Affresh keeps me from having to scrub the inside nooks and crannies of my dishwasher. I love that! I've mentioned before that I also use Affresh to make my garbage disposal not smell. I've found that Affresh by Whirlpool is a great product to keep both dishwashers and disposals smelling clean and running properly! Where Can I Buy Affresh Dishwasher & Disposal Cleaner Tablets? Affresh is avaialble at retailers nationwide, including Sears, Best Buy, Lowe’s, Kroger and Food Lion, and at www.affresh.com. A pack of 6 tablets has a suggested retail price of $6.99. I wrote this review while participating in a campaign by Mom Central Consulting on behalf of Affresh and received product samples and a promotional item to thank me for taking the time to participate. Ever since I moved into my apartment, my dishwasher really smells whenever it is opened and especially if it is running and so I really appreciate you explaining how deodorize it. I have tried the vinegar, baking soda and lemon juice option too, but it’s not working for me. However, I really like your idea about using Affresh. I have never heard of that type of cleaner before and so I’m glad that you listed off places where I could get it.